At the end of last year, Delegate365 version 6 was announced. We added a bunch of features and before updating all tenants, we wanted to improve some functionality. So it took some time to develop and test new features. Now it's time to update all existing Delegate365 tenants to the latest version 6.1. See the most relevant news at a glance here! Important: Some customers are already using Delegate365 version 6. All D365 tenants will be upgraded to version 6.1 in the next days. All customers will also receive an email notification about the exact upgrade time. 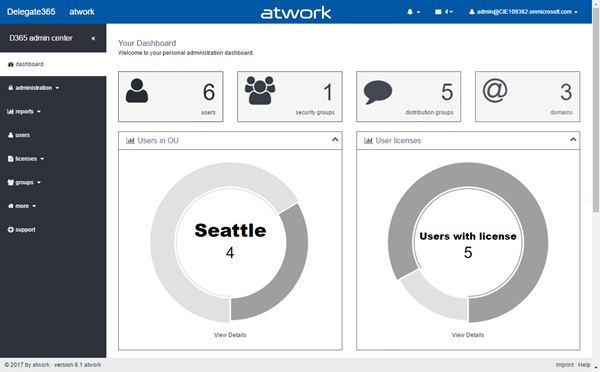 If you have any reservation against the D365 tenant upgrade time please contact us at support@atwork.at. This article includes all changes of Delegate365 changelog version 6-overview and all new features of version 6.1 (so there is no need to check out older articles). Some new features will be described more detailed in extra articles in the next days. Delegate365 stays as it is. No worries, Delegate365 will not change and you can benefit from improved and new features. The "biggest" change in the UI is the restructured left menu as follows. New menu: The menu has been simplified by using groups. Pls. see the details - where to find what - in this article: Delegate365 changelog version 6-Menu restructuring. To download an Excel sheet with all menus and a comparison between v6 and previous versions, click here. We think the new menu is more structured (much smaller) and helps to find related functions quicker. 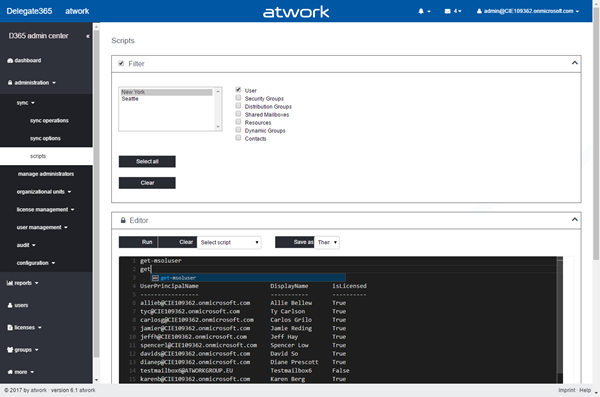 New Audit Logging: Large tenants and many operations can produce large audit logs in Delegate365 since every operation and every sync jobs is protocolled. We wanted to optimize the logging. 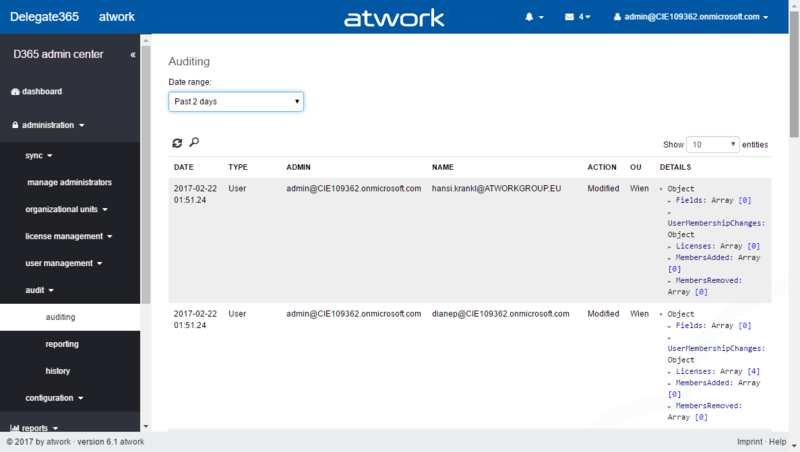 So, we completely redesigned the logging system in Delegate365. The audit logs (what happened when in D365 by which user) are now stored in the D365 database for up to 90 days for quick access. Additionally, the audit logs are no longer in the file system, but stored in Azure Table Storage. See more details at Delegate365 changelog version 6-Logging. The audit logs (from the database) can be filtered in administration / audit / auditing. The information is now structured with toggles. You can expand the desired information as here. In this sample, that user has been assigned to E5 plan. We think this new visualization helps to find information faster and in a more structured way. In the background, all data is stored as JSON object in the logs which helps for using this data in Power BI later. The D365 module will show the latest audit logs up to 90 days. Export Audit Logs: In administration / audit / reporting the audit logs can be consumed directly and then exported with a tool as Microsoft Azure Storage Explorer. In here Portal Admins can access the key to the D365 Azure storage and download a sample Power BI dashboard file for further use. An article about the possibilities and the How-To will follow shortly. Historic Audit Logs: "Old" audit log files (in CSV format) are still accessible in the administration / audit / history module. All audit log data is currently additionally written to these logfiles as well. Our plan is to remove this "old" logging in one of the next versions. We encourage our customers to download existing log files if needed. In future versions, this logging and this module will be removed and only the new auditing functions will be available. 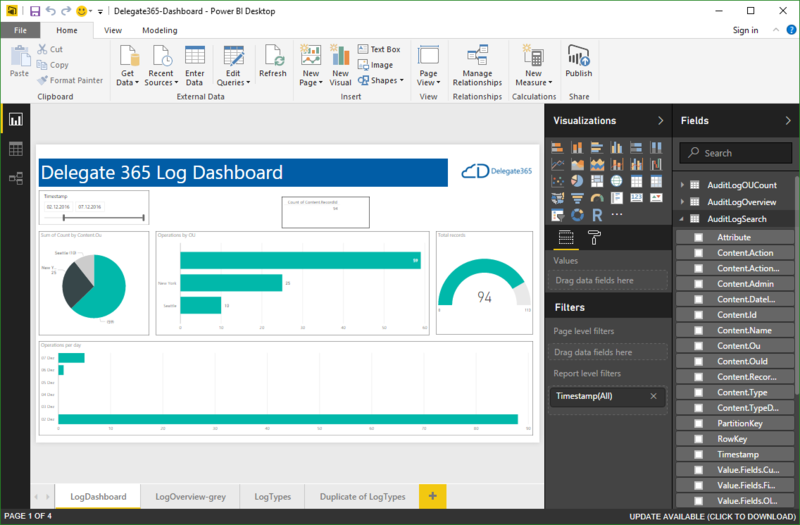 Power-BI (Beta): The new logging allows the protocolled data to be used in Microsoft Power-BI. 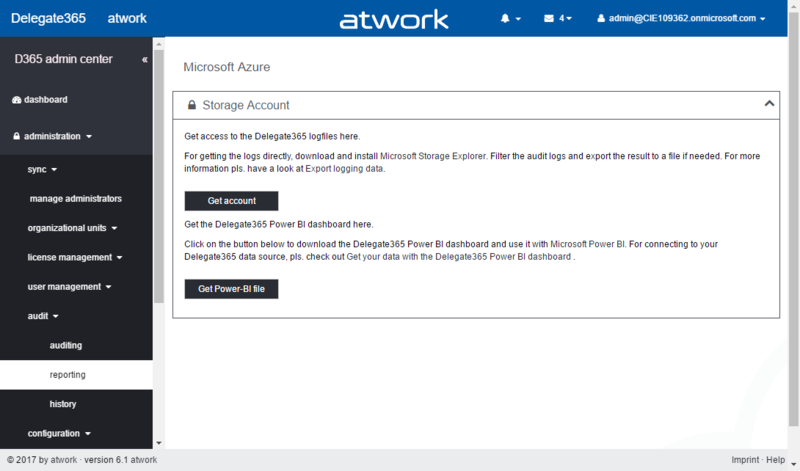 Data can be exported and reused directly from the D365 Azure Storage. In return, the reports section in Delegate365 will be removed in one of the next versions. There will be an article showing the steps shortly. New PowerShell (Beta): For Portal Admins, there's now a scripting module available. This allows to write and execute PowerShell scripts and to load and save them in a small management console. The important part here is, that you can easily define the scope, you want to execute the current script: on Office 365 tenant level, for specific OU's or for custom objects. To see all details of this module, pls. see the upcoming article about scripting. This module is currently just for demo purposes and will be enhanced in the next version, more to come. 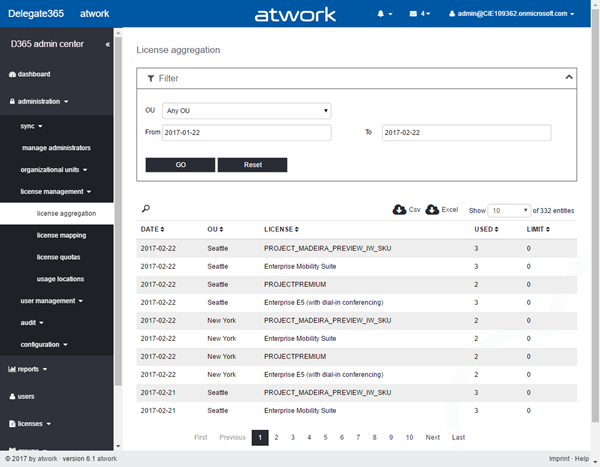 Assign licenses: The visualization and the "toggle" function (like in the audit logs) are now used in the licenses / assign licenses module as well. That's smart and handy, right? New Daily License Statistics: This new statistics delivers the daily status of Office 365 licenses used per OU. This historic data can be used for cost centers or other purposes to see the exact license statistics per OU and per day. The data can be filtered by date and OU and can be exported with one click as CSV or Excel file. New: Mail flow: Admins can now activate Mail flow tracing in D365 in the new more / mail flow module! This feature can be configured for specific senders and recipients and for a date range for the past 24 hours, 78 hours or 7 days. Find more about Mail Flow in Exchange Online here. New Sync Options for Security Groups: Security Groups now can be automatically assigned in administration / sync / sync options by their name (since they do not have any properties to control automatic assignment as other objects in Office 365). A free prefix can be defined to split an OU name and the group name, for example, "New York_HR" would assign that security group to OU "New York". By default, this new switch is turned off. Configure and use this option as desired for your organization. Now you can even auto-assign Security Groups by name. 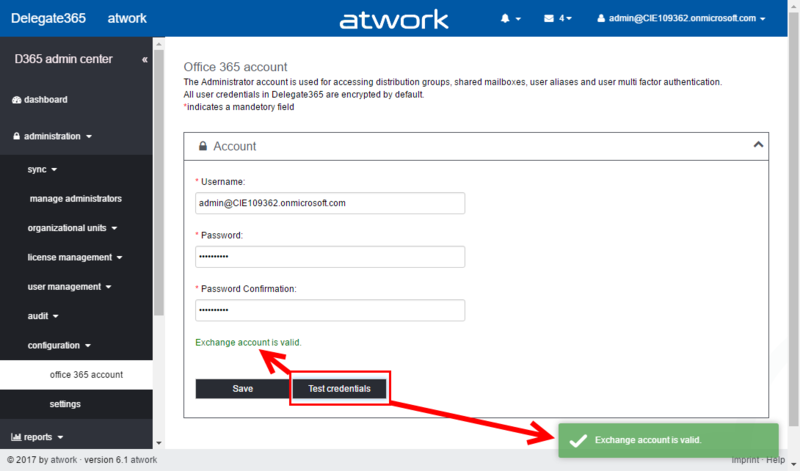 New: Test the service account: One issue that happens easily is that the Office 365 service account expires (or gets disabled or the password must be changed). In such a case, Exchange operations fail in D365. Now D365 checks the validity of that account automatically when starting. Additionally, Portal Admins can now test the saved credentials anytime in administration / configuration / office 365 account with the new "Test credentials" button. This makes sense, if you just changed the account or if operations fail and you want to test the saved service account. Simply click the button! D365 tries to access Office 365 with that account and informs about success or failure as shown above. 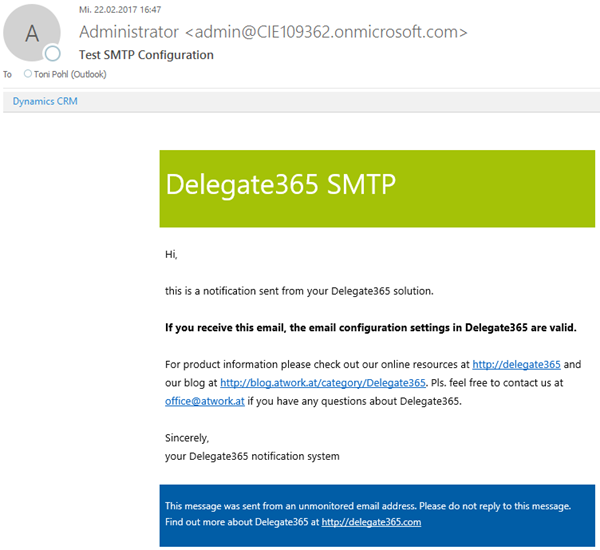 New: Test SMTP settings: In administration / configuration / settings , the Portal Admins can now also test the validity of the saved SMTP settings and use the new "Test your SMTP configuration" setting to send emails to check if this works out of D365. Enter a valid email address, click the "Test" button and check the result to see if the stored configuration works. This ensures that D365 can send notifications in specific scenarios (for example when license orders are sent). The recipient will get a email message (using the new D365 email template) as here. New: Delegate licensing: The bell icon in the top menu bar shows the number of consumed D365 licenses. D365 changes the color of the licenses are about to end or are used completely (traffic signal colors green, orange, red). Synchronization Job: This job synchronizes all modifications from Office 365 to Delegate365 and runs every 4 hours. The same job can be executed manually anytime in Delegate365. License Aggregator Job: This new job runs all 6 hours and protocols the daily status of Office 365 licenses used per OU for further usage. Log Sink Job: This job runs all 5 minutes and pulls out messages from the logging queue and persists the data to the Delegate365 database and to Azure Storage. Sync Notifications: To optimize the transportation to the notification center, now this job takes care about checking for news all 3 hours and delivers them to the Delegate365 database. Fixes: Syncing of Dynamic Groups could produce an error because the API simply does not deliver the Object ID. We built a workaround for that, this is now fixed. Small changes: We took care of typos, we are using new email templates for notification emails, used better wording in some pages and added some descriptions in various pages. So, there are a lot of improvements in Delegate365 version 6.1. New features will be described in own articles. Existing D365 customers will be upgraded until end of February automatically. New Trials will also get this latest version from now on. We are continuing to improve D365. So, stay tuned for the next versions of Delegate365!